Heike Brachlow was born in Munich (Germany) in 1970. She studied at the University of Wolverhampton (BA in glass in 2004) and at the Royal College of Art in London (MA in 2006, PhD in 2012). Heike Brachlow primarily works as a self-employed artist from her studio at Parndon Mill near London, and as an educator and lecturer. 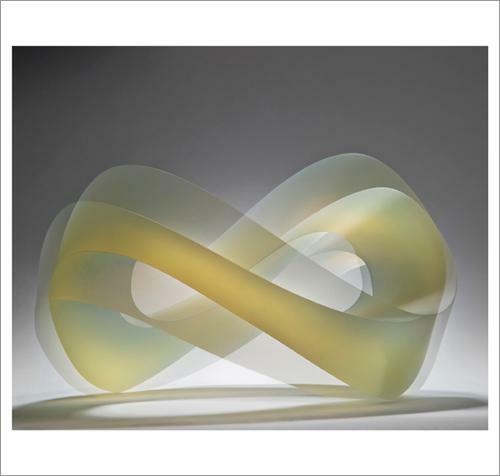 She regularly teaches summer school courses at the Studio of the Corning Museum of Glass, Pilchuck Glass School, and other institutions. Her often precariously balanced sculptures aim to physically engage: the viewer becomes toucher – invited by words or form, boldly or guiltily. Colour is an important part of her work: the exploration of the interaction of colour, form and light in solid transparent glass during her PhD research has led her to producing her own glass colours, adding metal oxides to the glass batch during the melting process. This enables her to create a personal palette, which consists mostly of subtle tones and polychromatic colours that change in different types of light. Her work reflects her attraction to movement and transformation, both in colour and form.